1. Over the past ten months, the government of Côte d’Ivoire has developed an interim poverty reduction strategy paper (I-PRSP) that takes stock of current policies and challenges facing the government and that outlines the main strategy to reduce poverty. The paper presents the participatory process used in preparing the I-PRSP and describes the future plan for an even broader consultation process under the PRSP. The paper meets the requirements for an I-PRSP and provides a sound basis for developing a fully participatory PRSP, as well as an adequate framework for continued Fund and IDA assistance to Côte d’Ivoire. 2. 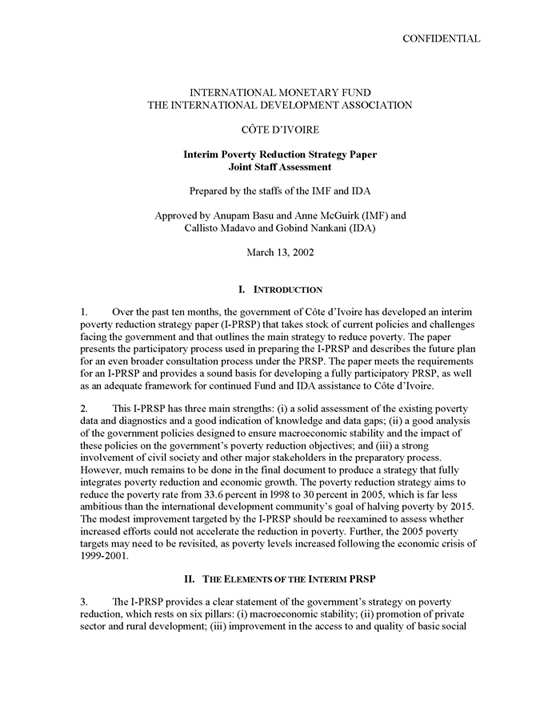 This I-PRSP has three main strengths: (i) a solid assessment of the existing poverty data and diagnostics and a good indication of knowledge and data gaps; (ii) a good analysis of the government policies designed to ensure macroeconomic stability and the impact of these policies on the government’s poverty reduction objectives; and (iii) a strong involvement of civil society and other major stakeholders in the preparatory process. However, much remains to be done in the final document to produce a strategy that fully integrates poverty reduction and economic growth. The poverty reduction strategy aims to reduce the poverty rate from 33.6 percent in l998 to 30 percent in 2005, which is far less ambitious than the international development community’s goal of halving poverty by 2015. The modest improvement targeted by the I-PRSP should be reexamined to assess whether increased efforts could not accelerate the reduction in poverty. Further, the 2005 poverty targets may need to be revisited, as poverty levels increased following the economic crisis of 1999-2001. 3. The I-PRSP provides a clear statement of the government’s strategy on poverty reduction, which rests on six pillars: (i) macroeconomic stability; (ii) promotion of private sector and rural development; (iii) improvement in the access to and quality of basic social services; (iv) decentralization; (v) promotion of good governance and capacity building to allow for better resource allocation and use; and (vi) strengthening of the security of people and property. 4. The preparation of a poverty reduction strategy document and the participative approach were fully endorsed by the government in the May 2001 speech of the Prime Minister to a workshop of public officials, members of civil society, traditional chiefs, the private sector, and representatives of political parties. The antipoverty strategy was regarded as being grounded in the President’s earlier workshop, which was held to achieve a consensus on the redesign of the cultural, political, economic, and social foundations of the country. The agenda of the PRSP was reviewed by the National Consultative Committee, which was established in mid-2001. A PRSP Supervision Committee was given the task of preparing the PRSP agenda and supervising and coordinating the preparatory work in consultation with concerned parties. A regional consultative group was also set up with links to the Secretariat for Structural Reforms. 5. The poverty analysis presented in the I-PRSP is limited by the availability of data, but it does provide useful information about the overall scale of poverty, including poverty profiles across regions and in relation to income level, access to health, education services, and gender issues. The poverty profiles draw on the analysis and findings of household surveys. These surveys are well done and provide a sound basis for an analysis of the correlation between poverty indicators and inequality trends. In late 2001, the government launched a new survey and its results should be incorporated in the full PRSP. In order to produce a meaningful program to reduce poverty, its causes by order of importance need to be better understood. Such an analysis would assess the availability of basic social services (education and health) and infrastructure (access to roads, electricity, water, etc.). The analysis should be buttressed by quantitative indicators of the vulnerability of the poor to unemployment, epidemics, the fragility of land rights, and access to urban housing. The poverty analysis should examine rural poverty issues and characteristics associated with rural poverty and inequality (land distribution, income sources, and participation in product and factor markets).